Extant Charadriiformes are a diversified and speciose group of birds and occupy many different habitats, from the open sea and coastal shores to semideserts. Molecular data provide a robust framework for the interrelationships of the various groups, which fall into three clades, the Lari, Charadrii, and Scolopaci (Paton and Baker 2006; Baker et al. 2007; Fain and Houde 2007). Crown group Charadriiformes share an unusually slow motility of the enzyme malate dehydrogenase (Kitto and Wilson 1966), but because some taxa exhibit a highly aberrant morphology, it is more difficult to characterize the group with derived osteological features. Most charadriiform birds lack pneumatic foramina in the pneumotricipital fossa of the humerus (except Stercorariidae), which may be a plesiomorphic feature. In many taxa the humerus further exhibits a marked dorsal supracondylar process (except in Jacanidae, Burhinidae, Alcidae, and Turnicidae), and the coracoid likewise has a characteristic derived morphology with a strongly ventromedially protruding acrocoracoid process. The late Cretaceous/early Paleocene "Graculavidae," which were considered "transitional shorebirds" by Olson (1985) and Feduccia (1999), were discussed in Chap. 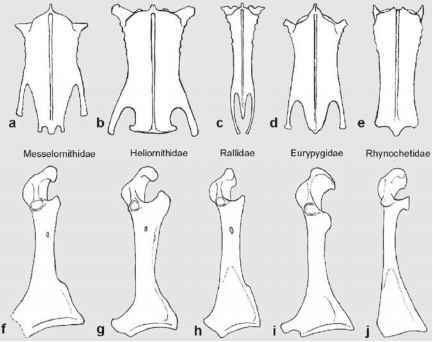 4 and cannot be convincingly assigned to the Charadriiformes on the basis of derived features. This is also true for various early Paleogene taxa that were considered representatives of the "Graculavidae." Dakotornis cooperi Erickson, 1975 from the late Paleocene of North Dakota, for example, was originally described as an ibis-like bird, but was assigned to the "Graculavidae" by Benson (1999), who referred further fragmentary bones from the late Paleocene of North Dakota to this taxon. None of these exhibit features which would unambiguously support a classification into the Charadriiformes, and the same is true for fragmentary remains of putative "Graculavidae" from the early Eocene Tingamarra Local Fauna in Australia (Boles 1999; see Chap. 10). Kievornis rogovitshi Averianov et al., 1990 from the late Eocene of the Ukraine was likewise referred to the "Graculavidae" in the original description. This small species, which is known from an incomplete humerus and an ulna (Averianov et al. 1990), needs to be restudied. The published illustrations suggest that it is more similar to the Procellariiformes or Phaethontidae than to the Charadriiformes. A representative of the Charadriiformes was identified in the middle Eocene of Messel (Mayr 2000c), but the specimen consists of wing bones only and cannot be assigned to any extant charadriiform taxon with confidence.